This is the 107th in a series of monthly reports that focus on developments affecting Papuans. This series is produced by the non-profit West Papua Advocacy Team (WPAT) drawing on media accounts, other NGO assessments, and analysis and reporting from sources within West Papua. This report is co-published by the East Timor and Indonesia Action Network (ETAN). Back issues are posted online at http://www.etan.org/issues/wpapua/default.htm Questions regarding this report can be addressed to Edmund McWilliams at edmcw@msn.com. If you wish to receive the report directly via e-mail, send a note to etan@etan.org. The Report leads with “Perspective,” an opinion piece; followed by “Update,” a summary of some developments during the covered period; and then “Chronicle” which lists of analyses, statements, new resources, appeals and action alerts related to West Papua. Anyone interested in contributing a “Perspective” or responding to one should write to edmcw@msn.com. The opinions expressed in Perspectives are the author’s and not necessarily those of WPAT or ETAN. 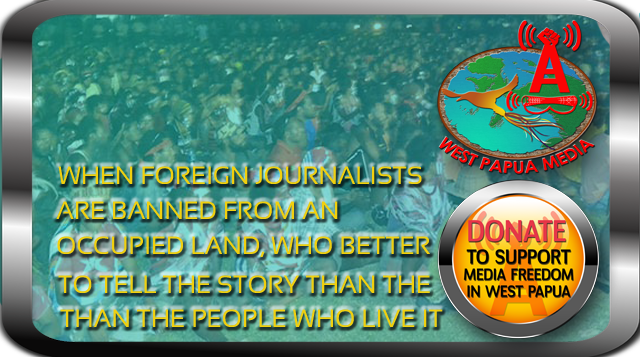 For additional news on West Papua see the reg.westpapua listserv archive or on Twitter. The West Papua Advisory Team (WPAT) condemns the February 21 violence. Such violent acts only perpetuate the cycle of violence that has trapped Papuans, particularly in the Central Highlands, for decades. WPAT vigorously condemns the actions of the Indonesian state security forces which, regardless of the provocation, have a fundamental international obligation to protect civilian life. The seizure and destruction of civilian homes and communal buildings as well as destruction of civilian food sources inevitably will force the flight of civilians to inhospitable forests and mountains. Many of those caught in such a maelstrom will surely soon begin to die. We call on governments, especially those like the United States which have partnered with Indonesian security forces , to use the influence garnered by such dubious cooperation to bring an end to these sweeps. The United States government, which condemned the February 21 attack on the Indonesian military is obliged to forthrightly condemn and seek an end to the Indonesian security forces ongoing assault on innocent civilians. We urge international bodies, especially the appropriate offices of the United Nations, including the Human Rights Commission, to turn their attention to these sweeping operations and which pose a lethal threat to large numbers of civilians. Humanitarian mechanisms must be immediately established to provide for the welfare of civilians whose lives have been disrupted and the area must be opened to both the humanitarian offices that will undertake that vital work and to credible reporting by journalists and human rights reporters. As of February 26, the Indonesian security force sweeps had burned at least 18 houses to the ground, destroyed five GIDI (Protestant) churches, and destroyed a library and two schools in Tingginambut, according to reliable church sources who relayed eyewitness accounts to West Papua Media. The toll on local civilians posed by the military/police operations is grave: “Witnesses have also reported that soldiers are deliberately burning and destroying food gardens and shooting livestock, including over 100 pigs. There are fears of a major humanitarian disaster unfolding with the reports of the destruction of food gardens and livestock, an act of collective punishment on a civilian population,” writes West Papua Media. Entire populations in villages the area of Gurake, Sinak, Tinggi Neri, Trugi and Nelekom have fled to the mountains. Several thousand people, mainly subsistence farmers, are said to live in the area. Townspeople from Mulia in Puncak Jaya are preparing to flee. As in the past, civilians who flee to the remote forests and mountains face possibly deadly separation from sources of food, shelter and medical care. Another trademark of these sweeping operations, also employed in the current military/police campaign, is the prevention of reporting on developments by the authorities. The only media personnel allowed into the operations area are those with approval from the Indonesian army. Independent journalists and human rights workers have been prevented from traveling into the area by a de facto Military Operations Area being applied across the entire highlands, including the regional center of Wamena. Papuan civil and religious leaders Rev. Dr. Benny Giay and Rev. Socratez Sofyan Yoman, among others, have pointed to the failure of Indonesian authorities to control the illegal sale of weapons in the Central Highlands as contributing to the February 21 attack. They have also noted the government’s long term objective of creating a new military command in the Central Highlands, an intention that is well served by violence in the area. “We believe that the Indonesian government and the security forces are part of the problem of violence [emphasis in original] which has been created by the state, preserved by the state and allowed to continue in order to legitimize yet more acts of violence in the Land of Papua and to take advantage thereof in order to strengthen the security forces,” they wrote. Both leaders called anew for “the Indonesian government to enter unconditionally into a dialogue based on the principle of equality between Indonesia and West Papua, with mediation by a neutral party, which is what happened in the dialogue between GAM (Gerakan Aceh Merdeka — the Aceh Liberation Movement) in Aceh. ” They urged the release of political prisoners and an end to the violence. Giay is Chair of the Synod of KINGMI Church, Papua; Yoman, Chair of the Executive Board of the Alliances of Baptist Churches in Papua. Radio Australia, on February 5 reported that West Papuans are seeking membership in the Melanesia Spearhead Group (MSG), a regional political and trade block which represents Melanesian peoples in the region, with the exception of the Papuan people in Indonesian-controlled New Guinea. The West Papua National Coalition for Liberation presented its petition asking to join the group to the MSG Secretariat in early February. The MSG is comprised of four nation states: Papua New Guinea, Vanuatu, Fiji, and the Solomon Islands. The group also includes the FLNKS of New Caledonia. The inclusion of the FLNKS, a non-state actor, could serve as a precedent for inclusion of the Papuan petitioners. Papuan leaders noted that Diamond ignored the extraordinary violence meted out to Papuans by Indonesian security forces since Jakarta forcibly annexed West Papua over four decades ago. Diamond also ignored Jakarta’s deliberate marginalization of indigenous peoples in favor of non-Papuan “transmigrants” brought to West Papua in a decades-long project that amounts to ethnic cleansing. Diamond was sued for defamation by purported “sources” from Papua New Guinea for article published in the New Yorker magazine in 2008. While the suit was withdrawn, it is expected that it will be re-filed soon. WPAT Comment: The U.S. government leaders, in justifying the betrayal of Papuan self-determination aspirations in the infamous New York Agreement of 1962, similarly demeaned the supposed backwardness of the Papuan people. Both the U.S. then and Diamond in his recent analysis rely on defamation of the people being victimized. The Papua New Guinea government announced the deployment of new military forces to its border in order to protect PNG citizens located near the border from the Indonesian military. The surprising February 18 announcement was accompanied by a formal protest by PNG Prime Minister Peter O’Neill’s government over the Indonesia’s construction of new military posts along the border. The protest also addressed Indonesian military harassment of PNG citizens. WPAT Comment: The Indonesian military has long operated smuggling operations across the Indonesia-PNG border and has regularly harassed Papuan refugees who have fled military pressure from Indonesia-controlled West Papua to Papua New Guinea. Bobbie Anderson in Inside Indonesia provides a detailed and insightful portrayal of life in remote, rural West Papua. Anderson describes how life is extraordinarily difficult and dangerous for Papuans and writes that the population there is completely bereft of government services. The government’s neglect of the majority of Papuans who live in rural West Papua over a half century is perhaps the most devastating critique of Indonesian governance. Amnesty International is calling for action to help two men detained in Jayapura. The February 25 Urgent Action states that “Daniel Gobay and Matan Klembiap are currently detained at the Jayapura district police station in Papua province. Police officers allegedly tortured or other otherwise ill-treated them and five other men while interrogating them about the whereabouts of two pro-independence activists.” While the other five were released, the other Gobay and Klembiap “have not received medical treatment and they have not had access to a lawyer since their arrest.” The Asian Human Rights Commission (AHRC) also released an alert on the case, as well as a video with an interview with two of those picked up at the same time as Gobay and Klembiap. The two activists, Eneko Pahabol and Obed Bahabol, describe how they “were arrested and tortured by the police on 15 February 2013 on the false allegation of being related with two pro-independence activists.” The video is available on AHRC’s YouTube Channel on http://www.youtube.com/watch?v=eMI1HouWMv4. The project will publish records of over 200 current and former political prisoners on its website, which will go live in March. To mark the 50th anniversary of the signing of the “New York Agreement” (September 1962) which led to Indonesian annexation of West Papua, we offer below a reflection regarding that agreement’s implications for West Papua. Dr. John Saltford, who has authored this Perspective, is an internationally respected scholar and author of The United Nations and The Indonesian Takeover of West Papua 1962-1969: The Anatomy of Betrayal. In October 1962 Dutch rule in West Papua ended and was replaced by a temporary UN administration (UNTEA). This was established as part of the UN-brokered New York Agreement , signed between The Netherlands and Indonesia to resolve their dispute over the territory. For all its flaws, this agreement guaranteed the Papuans the right to self-determination in accordance with international practice, but this never happened. Indonesia took over from the UN seven months later and never left. In October 2012 Indonesian security forces attacked peaceful political rallies in several West Papuan cities and intensified sweep operations in the Central Highlands forcing hundreds of villagers to flee . These were not isolated incidents. According to Amnesty International, fifty years after the New York Agreement, Indonesia continues to deny Papuans their rights to freedom of expression and peaceful assembly . A good reason therefore to re-examine the origins of this agreement, its content and implementation. In 1949 the Dutch ceded sovereignty of the Netherlands East Indies to the new Indonesian Republic but kept West Papua, not least because they reasoned that the Papuans were ethnically and culturally completely different to the Indonesians. Over the next thirteen years preparations for West Papuan independence progressed in the face of increasingly strong opposition from Jakarta which claimed the territory for itself. But arguments over who should determine West Papua’s future were superseded by the August 1962 signing of the New York Agreement, and its acknowledgement that it was for the Papuans, and no one else, to decide whether the territory should become an independent state or a province of Indonesia. Once UNTEA had withdrawn, Article 16 specified that some UN experts were to remain to advise and assist the Indonesians in preparations for Papuan self-determination that was to take place before the end of 1969. But these experts were never deployed because Indonesia objected. Under Article 17, one year prior to self-determination, the Secretary-General was to appoint a representative to lead a team of UN officials, including those already stationed in the territory. Their task was to continue to build on the work outlined in Article 16 and remain until the act of self-determination was complete. A Bolivian, Ortiz Sanz, was appointed but, as he made clear in his official report , the non-implementation of Article 16 meant that there were no experienced UN staff in the territory for him to lead. Instead he was left with a newly arrived team of 16 who were supposed to advise and participate in an act of self-determination covering a territory roughly the size of California. Under Article 18, all adult Papuans had the right to participate in an act of self-determination to be carried out in accordance with international practice. This central tenet of the agreement was never implemented. Instead, with no genuine involvement by the population, the UN effectively stood by as Indonesia hand-picked, bribed and threatened 1,022 Papuans to take part in the 1969 “Act of Free Choice” – a series of theatrical ceremonies in which the selected Papuans stood up on command to indicate unanimous consent for integration with Indonesia. The final wording of the UN report says only that the procedure had been carried out in accordance with “Indonesian” and not “international” practice as required by the agreement. One could argue “International Practice” is too vague a term here to have any meaning. But in fact, acceptable international practice had been set out in UN General Assembly Resolution 1541 of December 1960. This specified the circumstances under which a non-self governing territory (which West Papua was) could integrate with an independent state. Clearly the “Act of Free Choice” did not even begin to fulfill these conditions. General Assembly Official Records United Nations, 17th Session, Annexes Agenda item 89, Doc A/5170, Annex of 20 August 1962, Agreement between the Republic of Indonesia and the Kingdom of the Netherlands concerning West New Guinea (West Irian). Twenty-Fourth Session, Agenda item 98: Report of the Secretary-General Regarding the Act of Self-determination in West Irian. A/7723, 6 November 1969. [Including Annex I, Report by Ortiz Sanz, and Annex II, Report of the Indonesian Government]. General Assembly Official Records United Nations, 15th Session, 948th plenary meeting, Resolution 1541, 15 December 1960, Principles which should guide members in determining whether or not an obligation exists to transmit the information called for under Article 73e of the Charter, Annex Principle ix. These topics are addressed in more detail in the author’s book: John Saltford, The United Nations and the Indonesia Takeover of West Papua, 1962-1969: The Anatomy of Betrayal(London: RoutledgeCurzon, 2003). Pillay welcomed the Indonesian government’s decision to invite the UN Special Rapporteur on Freedom of Expression to Indonesia. Security forces arrested several people who sought to peacefully mark the 51st anniversary of West Papua’s independence. Initial reports indicate Indonesian security authorities employed tear gas to break up a demonstration in Jayapura (Port Numbay). Rallies were also planned to be held in Sorong, Nabire, Fak Fak, Manokwari, Wamena,, Timika and Serui. U.S. Ambassador Scot Marciel visited West Papua in early November in what State Department officials described to West Papua Report as one of a series of periodic visits by the Ambassador to West Papua. Marciel met with members of the Papuan Provincial Assembly (DPRP), the Papuan Peoples Council (MRP), senior members of the Provincial Military Command and the Inspector General of the Police Force. State Department officials told WPAT Marciel also met with civil society groups. In response to the ambassador’s question as to why the duties of the military command in West Papua were so much greater there than elsewhere and required such a different approach, the chief of staff said that the military were acting in accordance with their “duties” as ‘Noble Protectors of the People’ (Ksatria Pelindung Rakyat). In his meeting with senior police officials, the Ambassador reportedly urged that the police pursue a lenient approach. The police should not be seen as solely involved in arresting and detaining people, and the police should put a priority on activities which bring them close to the people. The Ambassador spoke positively about US cooperation with the police in future years. 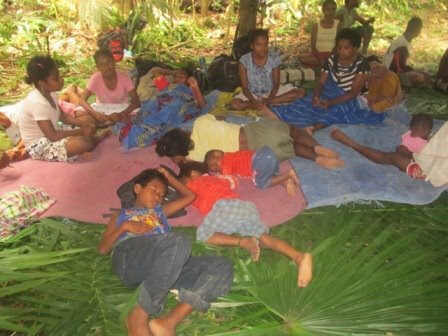 A report by Elsham revealed that 38 civilians who fled their village of in Keerom District in July remain in the forest. They fled because of five-month sweep operation conducted by the Indonesian military and police in the area. The displaced are subsisting on sago and worms, and children have been unable to attend school. Indonesian security authorities, especially Indonesian Special Forces (Kopassus) and the U.S.-backed police unit Detachment 88 are continuing to persecute leading members of the West Papua National Committee (KNPB). In October, Indonesian special forces sought in vain to detain prominent women’s and environmentalist activist Fanny Kogoya who, earlier this year, was elected to head the Papua desk for the WALHI, Indonesian branch of Friends of the Earth. The security forces also targeted students associated with her work. Kogoya, also a women’s rights defender from the grassroots Papuan Women’s Network TIKI, has been placed on a Papua wide wanted persons list (Daftar Pencarian Orang or DPO) by the U.S. and Australian-trained and funded Detachment 88 anti-terror investigators. A number of prominent human rights organizations and prominent civil society figures have recently called for human rights accountability in West Papua. Budi Setyanto, a lawyer who is the director of the Institute for Civil Strengthening. Setyanto called “extremely serious” the fact that many human rights violations against the indigenous Papuan people have never been resolved. “‘This matter needs to be resolved by the government which should make an inventory of all the cases that have occurred so that the general public is aware of the many cases that have not be resolved,” he said. Separately, Suciwati, the widow of the murdered human rights champion Munir Said Thalib, visited the Jayapura grave of Papuan political leader Theys Eluay on the anniversary of his November 10, 1991 murder by Kopassus. Suciwati used the occasion to speak out against the many inadequately resolved murder cases in West Papua. “Our society is too forgiving, too easy to forget. We must change this. They can kill Munir, Theys for speaking out the truth but they can’t kill the truth itself,” Suciwati said. Anderson describes one subdistrict in particular, Lolat, created in 2002, where there are almost no government services. Visibly malnourished children in the area show bloated stomachs and stunted growth. “A local NGO, Yasumat, runs five parallel schools, 19 health clinics, and four health posts. While paid teachers and health care workers are absent, a cadre of local volunteers strives to provide needed service,” Anderson writes. Immunization programs do not exist in remote areas. No immunizations have been provided by the district government outside of intermittent offerings in the town of Dekai in the last ten years. “TB and HIV rates in Lolat are unknown, but the number of young men, women, and children dying of unknown causes is out of proportion to the already abysmal provincial averages. It seems likely that men working in the cities as part of the construction boom caused by the proliferation of new districts are contracting HIV and bringing it home with them. Just as HIV infection levels are unknown, so are condoms, which have never been seen in the area,” reports Anderson. Summary: One demonstrator was reportedly killed, two were wounded, and 13 arrested in May 1 demonstrations throughout West Papua. The protests marked the 49th anniversary of Indonesia’s coerced annexation of West Papua. Indonesian government plans to continue to send settlers from outside into West Papua (“transmigration”) has prompted protests from Papuan organizations who fear the further marginalization of Papuans and growing communal tensions. Several international organizations have protested continued, longstanding efforts by the Indonesian government to cover up human rights violations by preventing journalists and rights observers from traveling to or within West Papua. Following large scale peaceful demonstrations in Serui district, Indonesian security forces have launched a crackdown involving sweep operations. The shooting of a civilian aircraft as it landed at an airport in the Puncak Jaya area caused civilian casualties and has prompted unproven charges by authorities that the perpetrators were the Papuan armed resistance organization, the OPM. Papuan leaders have called on the government to conduct a transparent investigation and to engage with local civil and government organizations to put an end to ongoing tensions and conflict in the Puncak Jaya region. They note that security force resort to force in dealing with incidents harms innocent local civilians who are often driven from their homes. Despite its obligations under Indonesian and International law, the Indonesian government is refusing to fund urgently needed medical treatment for Papuan political prisoner Filep Karma. Two new reports reveal extensive “land grabbing” by corporations, backed by the Indonesian government, at the Merauke Integrated Food and Energy Estate (MIFEE) project in southern West Papua. Indonesia faces a quadrennial review of its human rights performance by the UN Human Rights Commission. WPAT member Dr. Eben Kirksey has authored a new book on West Papua. The human rights organization ELSHAM Papua reported that large protests marked the May 1,1963 anniversary of Indonesia’s annexation of West Papua. Gunfire, targeting a peaceful demonstration killed one demonstrator and wounded several. 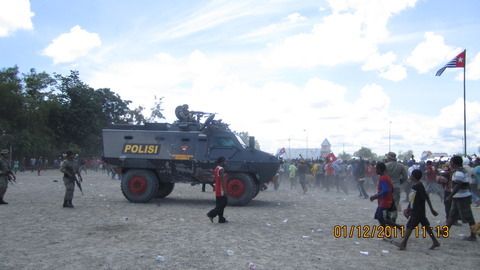 In addition, police arrested 13 demonstrators in Sentani. Demonstrations, organized by the West Papua National Committee (KNPB), transpired in various places in West Papua , the largest appears to have been in the Abepura area where a crowd assembled to hear a speech by Buchtar Tabuni, KNPB Chair. According to ELSHAM, Tabuni said in part: “On this day, 49 years ago, we commemorate the day when our people fell into the hands of the Indonesian state. All the Papuan people reject annexation by Indonesia.” Tabuni also said that May 1 marked the beginning of the perpetration of gross human rights violations against the Papuan people. Many of the demonstrators marched to the center of Jayapura, joined by supporters along the route. Some demonstrators attempted to fly Morning Star flags in a field alongside the tomb of the martyred Papuan leader Theys Eluay in Sentani, but they were prevented from doing so by the police, who arrested thirteen people. Among those arrested was Darius Koyoga, organizer of the action. One demonstrator, Terjolih Weah, was shot near the TNI’s Koramil base in Abepura. In addition, as the demonstrators were walking from the Elim Church to Koramil, an unidentified person or persons fired on the peaceful crowd. One victim of the shooting was taken by demonstrators to the Dian Harapan Hospital. Another victim, a fourth year student at the economic faculty at Port Nambay (Jayapura), was shot through the stomach and died. Indonesian security force were reportedly on alert for anticipated demonstrations associated with the dead student’s funeral. The head of the Office of Labor and Transmigration in the province of West Nusa Tenggara said the government would be sending more transmigrants West Papua. News of the new government-sponsored migration to West Papua prompted protest from local Papuan groups. According to a report in the daily Jubi, the Jayapura branch of the Association of Catholic Students of the Republic of Indonesia (PMKRI), condemned the plan to bring more transmigrants, contending that the move would further marginalize the indigenous Papuan people. The association also expressed concern that competition between indigenous Papuans and the transmigrants could generate “horizontal conflicts” (communal disputes). “The indigenous Papuan people have already become a minority in their own homeland. We strongly reject plans to bring in more transmigrants,” said Benyamin Lokobal, Jayapura chair PMKRI. If the government goes ahead with this plan, Lokobal said, his group would organize demonstrations in collaboration with other youth organizations in Papua. WPAT Comment: WPAT is collecting information on the rise in the formation and activity of ethnic/race based militias which it will present in an upcoming report. This militia formation, among transmigrants/migrants on the one hand and among Papuans on the other, is indicative of rising communal tensions which continued transmigration will only stoke. A joint report by the Faith-Based Network on West Papua, Franciscans International, Papua Land of Peace and the Asian Human Rights Commission concludes that the Indonesian government is tightening restrictions on journalists and non-governmental organizations which seek to cover developments in West Papua. The organizations contend that the Indonesian government has long restricted the number of foreign journalists granted permission to enter West Papua and write about the situation there. Those few reporters allowed to enter West Papua work under tight restrictions and were followed, according to the report. The report points to recent departure of Peace Brigades International (PBI) and the Indonesian government’s refusal to allow the International Committee of The Red Cross (ICRC) to re-open its office there. Last October, Pacific Journalism Review published a Pacific Media Watch report on the region’s media freedoms, which reported Indonesian repression facing news media. WPAT’s Report for March 2012 also contained reporting on the Indonesian government’s continuing campaign to cover-up human rights abuse and repression in West Papua. West Papua Media reported April 23, that Indonesian security forces have launched a major sweep in Serui District on Yapen Island. The sweep reportedly targeted Papuans had engaged in a large, peaceful demonstration on April 20 which had been organized by the West Papua National Authority (WPNA) to welcome the apparent launch of a branch of the International Lawyers for West Papua (ILWP). West Papua Media reported that armed Indonesian police and military conducted rolling raids on motorbikes across villages including Mantembu and surrounding hamlets outside of Serui town, seeking to arrest all those who were involved in the mass flying of the banned Morning Star independence flag. An earlier April 20 report in the daily Jubi, translated by the UK-based Tapol, had noted that a large number of the banned Morning Star flags were flown by Papuans in peaceful demonstrations in Tanggal (Serui District) organized by the West Papua National Authority (WPNA). Aston Situmorang, a member of NGO Working Forum of Cenderawasih Bay, Serui, told local media that thousands of people had gathered to take part in the demonstration from all parts of Serui district. According to Jubi, the local police chief had allowed the flags to be flown. On April 8, an unknown shooter or shooters fired on a commercial Trigana twin otter aircraft landing at Mulia Airport in the troubled Puncak Jaya region of West Papua. One person was killed and four wounded. As a result of the incident, air transport to the region by four local carriers was suspended, creating serious hardship for local people who depend on the airlink. The regional (Cenderawasih) Indonesian military commander quickly blamed the incident on the Papuan armed resistance, the Organizasi Papua Merdeka, the Papua Freedom Organization, or OPM. The Head of Public Information Department at police headquarters Chief. Comm. Boy Rafli Amar similarly told media on April 9 that the suspect is member of a group which had committed similar acts some time ago. As is frequently the case, the claim that the OPM was responsible for the attack was offered with no proof and before any serious investigation could be carried out. Police accusations about a suspect were made before the police had developed the most basic information such as determining from what direction the shots had come. An investigation by two commissioners of the Indonesian Human Rights Commission (Komnas HAM) also was unable to determine who was responsible, though they said that the perpetrator(s) were highly trained and were thought not to be regular police or military personnel. “Many security personnel have not been reporting to their units and that this should immediately be looked into,” said one commissioner. Several prominent Papuans have urged that Indonesian authorities not resort to the use of force as in the past. They argued that sweep operations, purportedly targeting the alleged perpetrators in various incidents do great harm to the local population. Indonesian security force sweeps regularly force innocent villagers to flee their homes, often to nearby forests where they suffer from lack of food, shelter and access to medical care. According to an April 13 report in the daily Bintang Papua, the co-ordinator of the Jaringan Damai Papua (JDP, Papuan Peace Network), Dr. Neles Tebay believes it is necessary to involve the OPM, not only in order to seek a way of preventing such events from happening again. He urged that “A strategic solution can be put in place for the long term, bearing in mind that responses to events up to now have been re-active” violence which only begets more violence. Fadel Alhamid, a member of the Papuan Customary Council, echoed Dr. Tebay’s concerns that violence should not be answered by violence. Alhamid added that nothing was yet known about who was responsible for the initial violence. The “security approach” was not the right way to improve the situation in Puncak Jaya. “A more persuasive approach is needed, and this requires the collaboration of all elements in society,” he said. “This means involving political bodies, the churches, customary groups all of which should be actively involved, bearing in mind that the security approach has a direct impact on the civilian population. If everyone gets together, it should be possible to work out who was responsible for the shooting,” he argued. There is growing international concern over the health of Papuan political prisoner Filep Karma who is in urgent need of medical treatment for a colon disorder. The Dutch NGO, Foundation Pro Papua, on April 22 wrote to the Indonesian health minister raising concern over Karma’s plight. The group noted in part that Karma, who was sentenced to 15 years imprisonment for his role in a peaceful demonstration, was examined recently by Indonesian physicians in Jayapura. They suspect that he has colon tumor and that he needs a colonoscopy and follow-up treatment. Because it is not possible to conduct a colonoscopy in West Papua the physicians referred him to a hospital in Jakarta. West Papua has long lacked even basic medical facilities and personnel. Karma has not been transferred despite this referral because prison officials have refused to cover cost of his medical treatment and travel. In an action alert, Amnesty International argues all medical costs for treatment of a prisoner at a hospital must be borne by the state, according to the UN Body of Principles for the Protection of All Persons under Any Form of Detention or Imprisonment (Principle 24). Indonesian law (Regulation No. 32/1999 on Terms and Procedures on the Implementation of Prisoners’ Rights in Prisons) also requires all medical costs for treatment of a prisoner at a hospital be borne by the State. WPAT notes that internationally, standard minimal standards regarding treatment of prisoners also were established by the “United Nations Congress on The Prevention of Crime and the Treatment of Offenders” held in Geneva in 1955 and approved by the Economic and Social Council by its resolutions 663 C (XXIV) of 31 July 1957 and 2076 (LXII) of 13 May 1977. In late February, in response to a petition filed by Freedom Now, the United Nations Working Group on Arbitrary Detention said that Indonesia is violating international law by detaining Filep Karma and called for his immediate release. There is growing controversy over plans by the Indonesian government to convert a vast area of southern West Papua into an industrial agricultural zone. The Merauke Integrated Food and Energy Estate (MIFEE) is similar to industrial agricultural zones in northern Sumatra and West Kalimantan where local people have seen forests which have sustained them for many generations sacrificed to the interests of Indonesian and foreign corporations. The MIFEE plan is intended to convert over a million hectares of land belonging to local people of West Papua into industrialized plantation agriculture. An extensive April 15 report in Tempo magazine describes extensive, ongoing conflicts between local people and over a dozen companies attempting to seize land long claimed by the indigenous groups. Tempo reports these conflicts have placed the whole MIFEE venture in doubt. We believe that it is important that people outside of West Papua also know what is happening in Merauke. However, information available about MIFEE can be confusing – much of it comes from different companies and government bodies, and each have their own way of describing the project that fits with their own interests and objectives. By compiling information from different sources, such as reports from the villages affected, from NGOs and other groups, from Papuan, Indonesian and financial media, from local and national government, and from company websites, we have tried to unravel what MIFEE is likely to mean for the people of Merauke. We hope that a more coherent understanding of how this land grab is taking shape will be of interest to people who are interested in West Papua, in the defence of forests and forest peoples, in the struggles against agro-fuels and against the growth of industrialised agriculture. Most of all we hope that this information can be the catalyst for action! Our initiative is independent, unconnected to the programs of any NGO, and we hope it can also be a source of inspiration. The report An Agribusiness Attack in West Papua: Unravelling the Merauke Integrated Food and Energy Estate is an attempt to give an overview of the situation in April 2012. The UN’s Human Rights Commission will review human rights progress in Indonesia in May, All member states of the United Nations must regularly submit to the Universal Periodic Review. The Commission process accepts submissions regarding the status of human rights observance by those facing reviews from States and also from non-governmental organizations. While the deadline for NGO submissions to the process has passed, individual organizations may still make submission to their governments. Documents from the upcoming 2012 review can be found here and from the 2008 of Indonesia are here. Freedom in Entangled Worlds: West Papua and the Architecture of Global Power by Dr. Eben Kirksey is now out from Duke University Press. Eben Kirksey first went to West Papua, the Indonesian-controlled half of New Guinea, in 1998 as an exchange student. His later study of West Papua’s resistance to the Indonesian occupiers and the forces of globalization morphed as he discovered that collaboration, rather than resistance, was the primary strategy of this dynamic social movement. Accompanying indigenous activists to Washington, London, and the offices of the oil giant BP, Kirksey saw the revolutionaries’ knack for getting inside institutions of power and building coalitions with unlikely allies, including many Indonesians. He discovered that the West Papuans’ pragmatic activism was based on visions of dramatic transformations on coming horizons, of a future in which they would give away their natural resources in grand humanitarian gestures, rather than passively watch their homeland be drained of timber, gold, copper, and natural gas. During a lengthy, brutal occupation, West Papuans have harbored a messianic spirit and channeled it in surprising directions. Kirksey studied West Papua’s movement for freedom as a broad-based popular uprising gained traction from 1998 until 2008. Blending extensive ethnographic research with indigenous parables, historical accounts, and compelling narratives of his own experiences, he argues that seeking freedom in entangled worlds requires negotiating complex interdependencies. Dr. Kirksey will be visiting Australia from May 16 through June 1st and is available to speak about Freedom in Entangled Worlds. This is the 91st in a series of monthly reports that focus on developments affecting Papuans. This series is produced by the non-profit West Papua Advocacy Team (WPAT) drawing on media accounts, other NGO assessments, and analysis and reporting from sources within West Papua. This report is co-published with the East Timor and Indonesia Action Network (ETAN). Back issues are posted online at http://etan.org/issues/wpapua/default.htm Questions regarding this report can be addressed to Edmund McWilliams at edmcw@msn.com. If you wish to receive the report via e-mail, send a note toetan@etan.org. has targeted civilians with destruction of a church, houses and other buildings. Human rights organizations are calling for an investigation of security force brutality associated with the October 16-19 Papuan Congress. Continued repression in West Papua and the Yudhoyono administration’s defense of the perpetrators of that repression as well as the impunity regularly accorded the perpetrators points to the Jakarta’s ultimate responsibility for the violence. The decade-old Special Autonomy policy in West Papua constitutes a strategy for subjugation of Papuans in their own homeland. Brutal Repression in West Papua: A Product of Rogue Security Forces or Yudhoyono Administration Policy? Where Are Indonesia’s Indigenous Voices In The Climate Change Debate? West Papua Media reports that a major offensive by Indonesian security forces in West Papua’s Central Highlands (Puncak Jaya) was launched on December 1. Special forces of the militarized police (Brimob) attacked the village of Wandenggobak on December 3, burned a church, an unknown number of houses and village guard houses. Initial reports suggest some civilian casualties, but the number of Papuan civilians killed and injured is not known. According to West Papua Media sources, the assault on the village was in reprisal for the killing of two Brimob personnel in earlier fighting with forces of Goliat Tabuni, a local leader of the Papua independence movement. The latest “sweeping operation” reportedly coincided with a December 1 peaceful demonstration by a large number of Papuans celebrating the 50th anniversary of the first raising of the Papuan independence flag at the district center of Tingginambut. National police spokesman Maj. Gen. Saud Usman Nasution says hundreds of troops have been deployed in Puncak Jaya. West Papua Media notes that the Brimob unit involved (the “anti terrorist” Gegana Brimob) has received Australian training and weaponry obtained from Australia. Video of attack on West Papua Congress. The November 29 Jakarta Globe reported that the Institute for Human Rights Study and Advocacy (Elsham) and the Communion of Churches in Papua (PGGP) said that at least 51 people had been tortured by members of the military and police during and after the October 16-19 Papuan Congress (see West Papua Report November 2011). These accounts echoed victim testimony reported elsewhere. The ELSHAM and PGGP report broke new ground, however, noting that security forces also looted and vandalized a monastery. The Rev. Wellem Maury of the PGGP said the National Commission on Human Rights (Komnas HAM) should assume responsibility for the investigation and specifically form a fact-finding team to investigate allegations of human rights abuses, torture and excessive use of force. “Komnas HAM must also report its findings to the Coordinating Ministry for Politics, Legal and Security Affairs so there is an open and fair trial,” he said. The injustice of the brutal assault on peaceful Papuan civilians at the Papuan Congress on October 19 has been compounded by exceedingly light sentences for the perpetrators of the abuses, including the death of at least three dissenters and the beating/torture of scores of others. A security force-led investigation produced official reprimands for 13 district police officers, four Mobil Brigade (Brimob) officers and one district police chief, while five Jayapura Police officers were given seven-day detentions. The silence of the President regarding the October 19 assault, the impunity accorded the perpetrators, and the defense of their actions by senior Yudhoyono administration officials underscore the President’s direct responsibility. Any impact of these minimal sanctions has been mitigated by comments by key security leaders. National Police chief Gen. Timur Pradopo told the House of Representatives that some police officers had taken the wrong approach during the third Papuan People’s Congress. However, he defended the measures taken saying “what we did [at Abepura] was part of law enforcement.” Coordinating Political, Legal and Security Affairs Minister Djoko Suyanto, at the same House hearing echoed Timur’s statement. “I hereby defend my colleague from the police. I think it’s impossible for officers [military and police] to commit violence for no reason – there must be a logical explanation for their anarchist deeds.” The spokesman for President Yudhoyono Julian Aldrin Pasha also has defended the assault, telling the Jakarta Post: “In principle, we have dealt with the Papua issue properly.” He added that the police were justified in forcibly dispersing the Third Papuan People’s Congress in Abepura when it found that it was an act of treason. Most tellingly, President Yudhoyono himself was dismissive of concerns about human rights violations arising from the October 19 assault, even when those concerns are raised by a foreign Head of State. President Obama, during their November Bali meeting, according to U.S. government sources, raised the October 19 assault. Yudhoyono told mediathat said he responded to the U.S. leader by contending that Indonesian forces were conducting legitimate operations against an ”insurgency” and that Indonesian forces came under attack from separatists. ”If there are members who have violated the laws, gross violations of human rights, then they will go before the law,” he said. ”I told him personally, there is no impunity, no immunity.” Apparently Yudhoyono public silence specifically regarding the October 19 extended to his evasive response to President Obama’s direct question. WPAT Comment: International reaction to the October 19 assault, mostly from human rights organizations, but also from some international parliamentarians such as U.S. Representative Eni Faleomavaega (see West Papua Report November 2011), condemned the Indonesian security forces as responsible for violence against peaceful dissenters. Such international opprobrium directed at security forces abuses over the years has been strong and often has identified specific units and officers as perpetrators of these rights violations. But such criticism may be misdirected. The silence of the President regarding the October 19 assault, the impunity accorded the perpetrators, and the defense of their actions by senior Yudhoyono administration officials underscore the President’s direct responsibility, not only for the assault, but for the climate of repression that assures such abuses will continue. The Yudhoyono administration itself, and President Yudhoyono himself, should stand in the dock for these crimes. A November 30 Jakarta Globe article by Andrew D. Kaspar underscored the importance of annual international climate change conference now meeting in Durban, South Africa. While much of the coverage in the run-up to the conference has focused on the failure of many developed nations, notably the U.S., to live up to commitments made in this area, another key issue is the extent to which perspectives of the indigenous peoples are (and are not) reflected in the deliberations. Kaspar writes that a key element of any climate change strategy is Reduced Emissions from Deforestation and Forest Degradation (REDD), which is intended to offer payments to encourage forest preservation to prevent the release of carbon dioxide stored in the trees. Kaspar points out that REDD is seen as a particularly potent means of emissions reductions because the vast majority of Indonesia’s emissions are attributed to deforestation. Up to now, Indonesia has accorded indigenous stakeholders little say in the fate of the forests that provide sustenance and shelter for many of them. This is particularly true in West Papua where Papuans’ objections to plans for a vast commercial plantation in the Manukwari area have been ignored. Papuan protest over decades of illegal logging either run by or protected by security forces and destruction of vast swaths of sago and mangrove by the Freeport mining operation also have been ignored. “Special Autonomy,” the Indonesian Government’s strategy for addressing the myriad problems confronting the Papuan people, is now ten years old. Inaugurated by then-President Megawati in 2001, the plan was intended to address decades of failed development and the absence of critical health, education and other services which have impoverished and marginalized the Papuan people since West Papua’s coercive annexation by Indonesia in 1969. The Papuan people have resoundingly rejected Special Autonomy, most notably in massive, peaceful demonstrations in June of 2010 (see West Papua Report July 2010). While most independent analyses have consistently described “special autonomy” as a failed approach, criticism of the plan has largely focused on Jakarta’s hapless implementation of the policy. But a closer analysis of Special Autonomy suggests a more sinister reading of the plan’s impact and real intent. Over the past decade the plight of Papuans has remained bleak. The poverty level, especially in non-urban areas where most Papuan live, is particularly revealing. The percentage of Papuans identified as living in poverty in the two West Papuan provinces in 2010 are among the highest in Southeast Asia. Special autonomy funds continue to flow into West Papua in a manner that benefits the transmigrant population. Special Autonomy has disadvantaged Papuans systematically and comprises in effect a strategy for subjugation of Papuans in their own homeland. According to the Indonesian statistical office (see BPS Nasional), the poverty level is 36.80% in Papua Province and 34.88% in West Papua Province. Most Papuans live in rural areas and when poverty levels for non-urban populations are separated out the marginalization and suffering of Papuans emerge as especially acute. In the villages of Papua Province the poverty level is 46.02%, but only 5.55% of those living in towns (home to most non-Papuan migrants), The dichotomy between village dwellers (largely Papuans) and towns (largely migrants) in West Papua Province is similar. In villages, 43.38% live in poverty, while in towns only 5.73%.do so. In reality, a large portion of the Special Autonomy funds flowing to West Papua has been devoted to infrastructure development and expansion of services in the towns to meet the needs of government-sponsored migrants (transmigrants) from other parts of Indonesia. The Ministry of Transmigration and Labor announced in late November plans to build three “new transmigration towns” in West Papua: Senggi in Keerom District, Muting and Salor in Merauke District (see p.6 Bintang Papua, November 29). Special Autonomy funding of projects and services for migrants appear to have aggravated the marginalization of Papuans demographically in their own lands. Papuans constituted only 49.55% of the population of West Papuaaccording to 2010 Indonesian statistics. Population growth rates according to these same statistics for dire for Papuans with at only 1.84% annual growth for Papuans and 10.82 annual growth for non-Papuans. The reality on the ground in West Papua is grinding poverty for many Papuans and a persistent dearth of critical services in rural areas where most Papuans live. Meanwhile, special autonomy funds continue to flow into West Papua in a manner that benefits the transmigrant population. Special Autonomy has disadvantaged Papuans systematically and comprises in effect a strategy for subjugation of Papuans in their own homeland. Bintang Papua reported that thousands of Papuans peacefully gathered at the the tomb of Theys Hijo Eluay at Sentani, District of Jayapura, to celebrate the 50th anniversary of Papua’s independence on 1 December. Theys Eluay was murdered by Indonesian Special Forces personnel (Kopassus) in 2001. At the gathering, the co-coordinator of the 50th anniversary committee, Jack Wanggai read out a series of demands which expressed support for international monitored negotiations on the future of West Papua and a referendum of the Papuan people who for decades have been denied the right of self-determination. At the gathering there were also calls for the Indonesian government to immediately withdraw army and police troops from Papua and to release political prisoners in West Papua. Wanggai also noted the Papuans rejection of the Indonesian government’s latest initiative to evade an internationally facilitated, senior level dialogue i.e., the creation of the special organization known as UP4B – Unit for the Acceleration of Development in Papua and West Papua (see West Papua Report November 2011 for background on this unit and its leadership). While the event was under way, troops conducted patrols along the roads, as well as in the vicinity of residential houses and shops. These activities by the security forces failed deter the people who completed their program peacefully.